Boom! It’s 20 days until the 2014 running of the RideLondon 100 kicks off (pedals off) from Queen Elizabeth Olympic Park. Are you excited? You should be*. 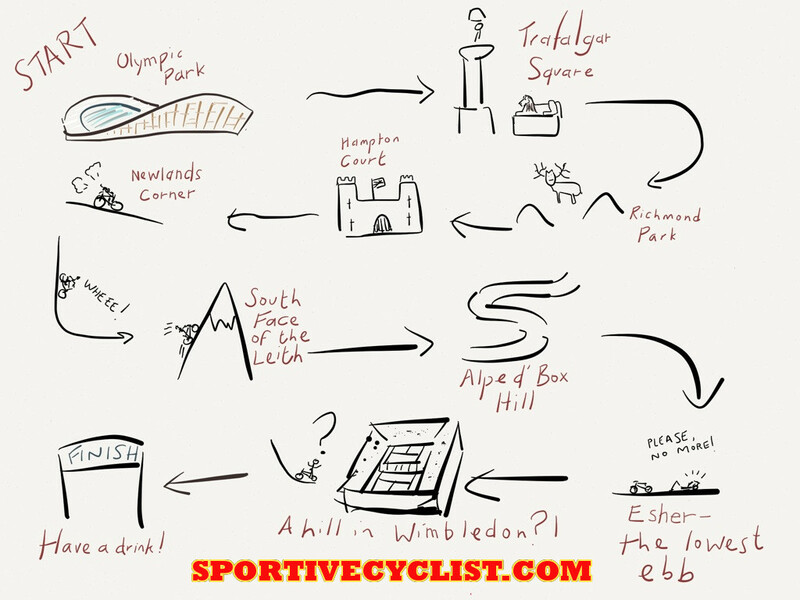 In this post I’m going to rehash share some of the stuff I’ve produced over the last 18 months relating to RideLondon. The aim is to inspire, inform and excite you, as well as reassuring anyone that’s having a last minute attack of nerves (headline message: DON’T PANIC, it’s going to be great). In a fit of post-ride excitement last August, I penned a post explaining why you must sign up in 2014. That ship has sailed, but the reasons I gave are just as useful as a pre-ride motivational pep talk. Riding on closed roads in London is fugging amaze-balls. Whilst that Madiba quote might be true in life, he never rode RideLondon. After you’ve climbed the great hills of Leith and Box (and the slightly lesser one of Newlands Corner), you won’t find many more hills to climb (other than an annoying little surprise slope in Wimbledon). There is no phrase more likely to strike fear in to the heart of the amateur endurance athlete (for yes, you are they) than, ‘You should now be coming to the end of your training programme’. You should now be coming towards the end of your training programme. Or at least you should be into the final 10 or so days of real effort, after which you’ll be tapering. Don’t skimp on the taper. The temptation, particularly if you’re worried that you’ve not done enough training, is to ride hard right up until the eve of the event. This is self-defeating. Any fitness gains you make in the final week will be offset on the day by fatigue from not being fully rested. At least give yourself 5-7 days of rest and very short, mostly light sessions. I went a little overboard in my pre-event analysis of what I would need to eat, writing a detailed ‘nutrition plan’. You certainly don’t need to do this – the bananas, energy drinks and other snacks available at the feed stations, along with a couple of gels and some Jelly Babies in your jersey pocket will be enough to get you round. My full ‘overboard post’ on RideLondon nutrition is available here. Finally, you’ll want to spend a few minutes perusing my thoughts on the ‘optimal’ way to spend the night before RideLondon… (don’t sue me). If you’re participating in RideLondon, I wish you the very best of luck. You’ll have an awesome day. If you’ve found this post useful (and even if you didn’t), please can you do me a big favour by sharing it with as many people as possible. Click a few of buttons below to post it to Twitter, Facebook and Google Plus. It will make my day, as well as help out a few people that might be looking for RideLondon information. I have done Leith Hill twice now. The first time was when I learn that 12:23s in the back weren’t a good idea. Now I have 13:28s. It was still tough, but once I got to the top recovered well and was fine all the way to Box Hill. Box Hill is much, much easier than Leith. I thought Newlands Corner would be tough, but it wash’t too bad either. From my recon on Saturday, Surrey council have done a wonderful job on the roads. Beautifully smooth. Thanks Michael. Ha! I’ve just realised that you’re talking about gear ratios. I was being a muppet and thinking you were talking about times! I have a 30 as my largest cassette cog and a compact set of chain rings (so 34 at the front). I was very thankful to have that combo on the day. For me it wasn’t so much about getting up Leith, it was more about doing it in such a way that I didn’t destroy my legs ahead of the remaining 40 or so miles. Good to hear that the roads are good throughout. Makes such a big difference. Good luck with your remaining training. I am travelling from Thailand to do the ride, I saw it randomly on Youtube in Feb and decided to book a spot for the event. 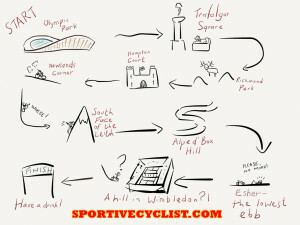 Next week I am staying in Westcott, Surrey to have a few practice runs at these climbs. I have found all of your information great, after reading this latest post I am not worried about these climbs at all 🙂 I am running a compact crank on the front and a 12-32 cassette on the rear, “spinners are winners”, so I’ll be spinning my way to the top! It will be my first time in the UK and I’m guessing it’s a great way to see the place. Keep posting, keep up the good work, love your blog! Thanks Som. Glad you’re enjoying the blog. The compact + 32 will be incredibly useful – being able to spin when you have other cyclists riding erratically is great. I am bit nervous about the ride itself but at the same time I am so looking forward. Absolutely. You’ll have a great time! Thoroughly enjoy the blog and feeling reasonable about the hills. That’s bad luck Paul. Hope you get back on the bike soon. I’m sure it’ll work out fine. ”Last realistic chance” Don’t you believe it Paul – At 69 I am riding the London 100, my 4th sportive this year (and they were all much lumpier than Surrey) hope you make it for Aug 10th but if not – see you next year. This is really useful and helpful with good insights, thank you. I’ve struggled to keep to a strict training regime; relying on lots of hill climbs and mid distance (40 to 70 mile) sportive at weekends. I am about to go out on a 100 miles session (15 days before the event) to prove I can do it; then scaling back in the run up! Whilst a few years away from claiming my pension I am coming late to the sport but excited as a kid at Christmas! A very useful guide (did it last year but always good to refresh). By the way the route download you’ve got there is slightly wrong as in Kingston on the outward leg it turns right earlier than marked as it goes right after Tiffin School up Cromwell Road (the opposite way to the one way system) then after the bus station it turns right again and swings behind the station (as it did last year) then back onto Wood Street as shown. On the return leg the route goes through the market place (it couldn’t do this last year due to works but it was always the intention to put it through there) to the end of the bridge then right along Horsefair under John Lewis around the Wood Street in front of the station then left up Fairfield North as shown. Just yesterday did a, ehm .. sort of a recce … of the 2013 route, with a slight deviation, starting and finishing in Harrow, joining the route from Chiswick all the way round till the now closed Putney bridge. if the roads are closed this has a potencial to be a good ride, bot not a great one. Closed roads in London are fun, then till you hit Newlands Corner there’s not much to do but ride, really. Newlands got a sharp bit at the beginning, then eases off, its an easy climb. Nice fast straight-ish descent. Leith Hill was tough, the undulating parts either make it easier or harder, you have to try. Lovely dark adrenaline fueled high speed descent on the other side. Box is a steady ‘easy’ climb even after all those miles in the legs. Loved that sharp uphill bit after the tight left-hand turn. Route back to London a bit boring but fast-ish. Wimbledon hill is a nice surprise as is the much shorter ‘taster’ after Norbiton. Re: Gears – just to brag 🙂 I’ve got a triple 48-38-28 and 7speed 14-28 at the back. Climbed all in 38-24 lowest, even if it needed out-of-saddle effort. Thanks for a great blog. Need to get some more hills in my training before hopefully doing this next year! Well my wife and I have 7 days left before 2018 Ride London 100, the information has settled our last minuet nerves. its a great read and a big thank you.